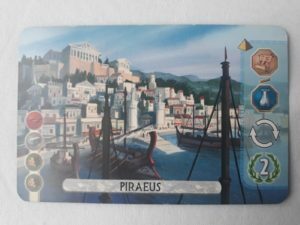 The Piraeus is one of the best designed cards in 7Wonders Duel. It has two effects that are both very powerful individually, but because they work against each other, the card is not overpowered. The Piraeus has two effects: you get one papyrus or glass every turn, and you gain an extra turn when you build it. As we explain in this post extra turns are very powerful in 7Wonders Duel. Since papyrus and glass are rather rare resources, getting one of them every turn is also powerful. The reason that the Piraeus is not completely overpowered however, is that the resources effect and the extra turn effect of the Piraeus are hard to combine. Because to obtain the maximal benefit from the resource bonus, you want to play the Piraeus as early on in the game as possible. This way, you get the most use out of the free resource. But, extra turns generally get more powerful as the game goes on. Because extra turns can be leverages to obtain specific cards, and the cards that are available in the later eras are much more powerful than those in the early eras. How to deal with this tension? The resource bonus is so powerful that the Piraeus simply must be played early on in the game, preferably during the first era (unless you happen to stumble on a bunch of papyrus and glass of course). The Piraeus is not very expensive so usually this should be possible. Because the cards in the first age are not that strong, it is not possible to benefit greatly from your extra turn. Since we know this, we should seek a small benefit from our extra turn. Maybe we can steal away a resource card that our opponent would like, or a card that your opponent can get for free, you name it. The trick with the Piraeus really is to avoid getting greedy. If we get greedy and try to leverage the extra turn for a big advantage, we probably end up playing the Piraeus halfway through the second age, which is wasting our resource bonus. > Click here if you want to beat your opponent by playing the Piraeus like an expert!